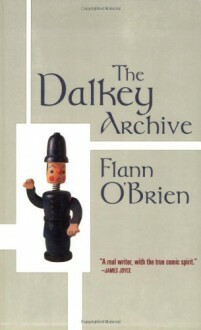 Hailed as "the best comic fantasy since Tristram Shandy" upon its publication in 1964, The Dalkey Archive is Flann O'Brien's fifth and final novel; or rather (as O'Brien wrote to his editor), "The book is not meant to be a novel or anything of the kind but a study in derision, various writers with their styles, and sundry modes, attitudes and cults being the rats in the cage." Among the targets of O'Brien's derision are religiosity, intellectual abstractions, J. W. Dunne's and Albert Einstein's views on time and relativity, and the lives and works of Saint Augustine and James Joyce, both of whom have speaking parts in the novel. Bewildering? Yes, but as O'Brien insists, "a measure of bewilderment is part of the job of literature. "Set in the late 1940s in the village of Dalkey (some twelve miles south of Dublin), The Dalkey Archive also includes in its cast the mad scientist De Selby (featured in O'Brien's novel The Third Policeman), the magniloquent Sergeant Fottrell (whose "molly-cule theory" holds that a man can turn into a bicycle), and the local da Vinci, a looderamawn named Teague McGettigan. Doing his damnedest to find order in this metaphysical chaos is Mick Shaughnessy, who--with the aid of strong drink, his friend Hackett, and Mary, the young woman for whom they both compete--undergoes a crisis of faith both sublime and ridiculous.